Eastern Market, Detroit, September 2017. Chef Sharwin Tee of Lifestyle TV's 'Curiosity Got The Chef' tastes microgreens with Filipino Kitchen's Sarahlynn Pablo. Behind them stand Chef Jake Williams and Dorothy Hernandez of Sarap Detroit, a Filipino pop-up. 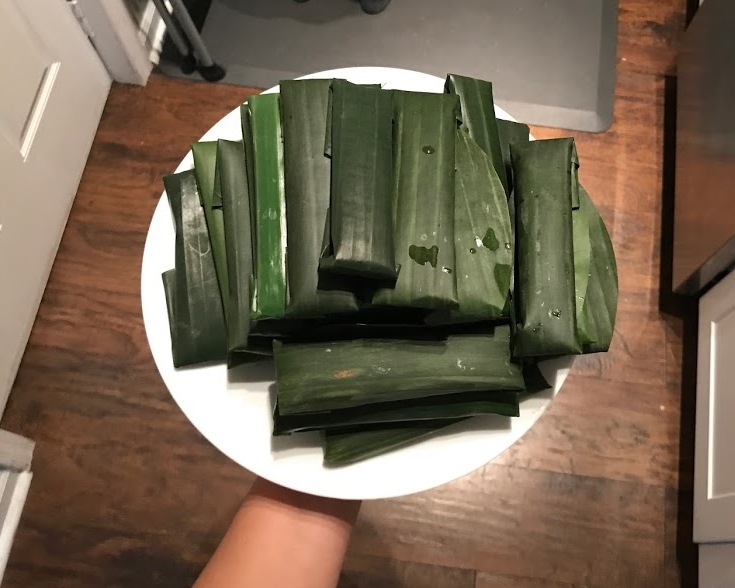 After participating in Kultura Festival in Chicago, Sarap Detroit invited Chef Sharwin and Filipino Kitchen to throw a collaborative popup dinner at the historic Eastern Market to raise money for AHON Foundation, a nonprofit organization that builds libraries in the Philippines that Sharwin champions. Not pictured: Filipino Kitchen co-founder Natalia Roxas who is taking the photo! Filipina-American entrepreneurs, Sarahlynn Pablo and Natalia Roxas, are creating a larger conversation through food and tradition. They draw inspiration from their childhood memories (both in the United States and Philippines) as well as their drive to celebrate their culture's cuisine, heritage, and people. How did Filipino Kitchen come to be? NR: Filipino Kitchen started when Sarahlynn was travel writing. When she wasn’t writing about travel, she was writing about food, more specifically the Filipino food she wanted to cook from her childhood. SP: I did this to keep up with my writing practice and to keep readers engaged when I was between trips. One recipe in particular on Lugaw--a rice porridge--struck a chord with a lot of my blog’s readers. “Thank you so much for sharing this. I’ve had a nasty cold and cough for three solid weeks, and my body craved this dish. However, we lost our mother last year to cancer, and she is no longer 'a phone call away' to walk me through her recipes. I reached out to my siblings and we each took our best guess as to the ingredients from years of watching our mother prepare the dish on cold winter nights as we grew up. I love the simplicity of your recipe--and it is one I found using 'cooked rice' just as my mother did. Thank you!” None of my other travel service pieces had a deep emotional response from a reader like that. I started to think about food writing seriously as an endeavor to reclaim the narrative of Filipino food from a Filipino-American perspective. NR: Around this same time, Sarahlynn and I also started rekindling our friendship. We took a trip to Puerto Rico, and worked on a piece for her blog regarding Typhoon Haiyan that devastated the Philippines in 2013. SP: That piece Natalia mentioned was about the complications of charity work in underdeveloped countries devastated by natural disaster, and how it affected our diaspora community, and how choosing a channel of aid to donate to isn’t as easy as it seems. A difficult piece with lots of nuance to navigate and it was the first piece I consider that we worked on that tied together our parallel Filipino-American experiences, in response to a community crisis. In addition to working on that piece conceptually, Natalia is a wonderful photographer and writing is more of my strong suit. 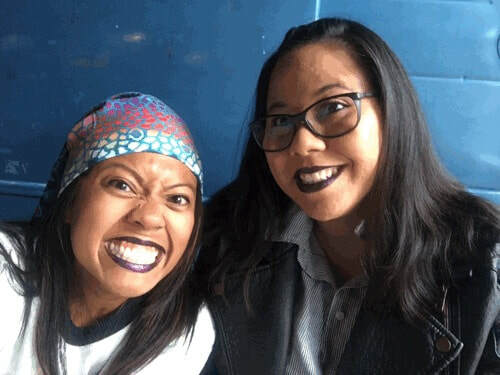 We both have years of experience organizing in the Filipino community, too, so she was naturally the best person to ask to be my business partner. Was cooking Filipino food an integral part of your childhood? NR: It’s interesting. I don’t feel Filipino food was integral to my childhood actually, even though I was born and raised between the Philippines and spending summers in the Bay Area. I had to sneak around to eat Filipino food on the street for my merienda (mid-afternoon snack) because I knew that my mom didn’t want me eating it since Filipino food was not often served on our table at home. Although, the food that I was allowed to have were taho, which is a silken tofu, muscovado sugar syrup and tapioca that is usually served for breakfast, and tulingan (skipjack tuna) brought by family members from Batangas, and then if I am asked what I want for a meal at home I would always ask for tinola. SP: Definitely. Fresh lumpia with Easter Ham. Empanadas with Thanksgiving turkey. Pancit with all of the Christmas dishes. Filipino food was always on the table for holidays at home in addition to American holiday food. We all ate together and played mahjong afterwards and storytelling and joke cracking happened all night long. Everyday meals, we always had steamed jasmine rice, whether or not the ulam (literal meaning in Tagalog is “dish served with rice”) was a Filipino recipe or a grilled medium rare to rare ribeye (my dad’s favorite to cook and eat!) or hamburger mixed with onion and pan fried. No hamburger buns in our house! Growing up in the Chicago suburbs in the 1980s we never went to eat out at any Filipino restaurants. Very few existed outside the city at that time. So my major experiences with Filipino food growing up were at home in Chicago and at home (where my mom and I would go for a month each summer) in the Philippines with our extended family. I remember being a very picky eater as a kid, so it’s an interesting path that my life has led me to! What’s your favorite Filipino dish? Can you describe to us what ingredients are in the recipe? SP: My favorite Filipino dish is sinigang (see-nee-gah-ng). It’s a sour soup, and often given that pucker with tamarind or guava or camias (belimbing). We’ve made ours here in Chicago with lemon, sorrel, or rhubarb, depending on what’s in season. There’s also trusty flavor packets that save some time when I can’t head out to buy fresh produce. I like mine so sour that you kind of wince a little bit when you taste the broth. That way when I add my steamed jasmine rice to it, it’s perfect. The dish can be made with any combination of leafy greens, other vegetables and protein. I prefer to make mine with salmon (heads or filet) or sometimes pork (a cut with a bit of fat on it works nicely); and I add a banana pepper for just a tweak of heat. NR: My favorite Filipino dish is tinola, a garlic-ginger soup with chicken, papaya, and malunggay leaves (moringa). In the kitchen with Sarap Detroit, Detroit, September 2017. The team, with Chef for-hire TJ Robinson (far right) who helped out the Sarap Detroit collab, enjoys a break from prep work with Chef Jon Kung of Eastern Market's Kung Food (far left), who brought some tasty snacks. The two of you seem to be part of a larger movement of Filipino-Americans who are leading the conversation around Filipino food. SP: We’re in an age where two Filipina-American women in Chicago can have a platform that can reach Filipinos all around our city and even all around the world. These platforms allow us to be in dialog with one another; it’s a conversation. So that means we can work in collaboration with one another, and support each other’s projects, even from afar. Another aspect I’ll mention--to paraphrase an interview with Chef Alvin Cailan--I think the fact that many of the new crop of FilAm chefs “coming of age” at this time, where they’re old enough to have a good amount of professional experience while also having grown up with Filipino food at home together with the Internet and social media really becoming ubiquitous, have something to do with what people from outside the community and the diaspora may see as a boom. It’s really a renaissance, though; part of waves of Filipinos before us who have championed our food. What is the Kultura Festival? And when and where is it happening this year? SP: Kultura is a Filipino food and arts festival that celebrates everything it is to be Filipino-American in Chicago. We have a bevy of FilAm chefs creating their twists on Filipino classic dishes without compromising on the flavor that those of us who know the cuisine expect. You’ll find FilAm djs and performers, who are all well known within the Chicago and international music scenes, giving the room a wonderful party vibe. A line up of FilAm scholars and arts practitioners give talks during the day on how their work relates to Filipino food. FilAm vendors sell art, clothing, accessories, and more. We invite a number of community based partners--non profit organizations who work within the Filipino-American community and the greater Chicagoland community whose missions we strongly align with. This year, our fourth year, we have lots of surprises planned. That’s what Kultura Festival is on the surface--a one day event--but it’s really the culmination of a year’s worth of partnership building and hard work with Filipino American chefs, artists, performers, scholars, and vendors. NR: We are currently planning for Kultura Festival 2018, and it will still be in the City of Chicago, and it will be held in August. We will let you know the moment we solidify our plans. Portland, Oregon, September 2017. At the Bon Appetit Feast festival, Chef Carlo Lamagna (far left) with his cousin and sometime-prep cook Mel Lamagna of the soon-to-open Magna Restaurant, collaborated with chefs Isa Fabro of Los Angeles (next left), and (not pictured) Alvin Cailan of Eggslut Los Angeles on a Filipino Whiskey Pig dinner. Beloved Filipino American comedian Rex Navarette (center, sunglasses) joined us for a quick laugh break during prep. Left to right, we are Chef Carlo, Mel, Chef Isa, Rex, Sarahlynn, Sharwin, Natalia. What has been the most rewarding aspect of Filipino Kitchen? NR: The most rewarding aspects of Filipino Kitchen are the relationships we have built in our community. At the risk of sounding cheesy AF, I don’t know what else I would rather do than what we do at FK. Through it all, the heartache, the tears, the laughter, and joy, the relationships/friendships we have built is the most priceless. In what ways do you hope Filipino Kitchen will grow? SP: As an entrepreneur, it’s a LOT of hustle. I know that Filipino Kitchen is already bigger than Natalia and me. And our business being community--and social justice--and change -focused, that’s as it should be. For the future I would love that our business sustain ourselves and a team of people to realize the events, programs, partnerships, and storytelling--books, films, and more--that our people, history, and cuisine richly deserve. Natalia and I have already grown so much personally through the work of Filipino Kitchen. We have built many partnerships and friendships, as she mentioned, that I hope continue to grow and to inspire others to do the same. Through our efforts I hope that the Filipino-American community in Chicago and in the Midwest can heal and grow together and thrive. Through our efforts I hope that Filipino-Americans and Filipinos in diaspora and at home can understand more of themselves and their history through our food. Looking to grab Filipino cuisine close to home? Here are some Natalia and Sarahlynn's favorites! Muscavado is a Filipino owned restaurant in Bastille that occasionally adds Filipino flavors to their casual breakfast and brunch menu. Le Servan does the same in the 11th, but in an upscale setting for their lunch and dinners. Lutong Pinoy is the mainstay of the Filipino British dining scene, open for 22 years now from the same family! London has a very strong Filipino supper club and popup dining scene: BBQ Dreamz (food stall in different night markets), maynila (supper club), Pepe’s Kitchen (supper club), The Adobros (supper club). Purple Yam is the classic. We always pay homage to Chef Romy Dorotan when we are in NYC. Kuma Inn or Lumpia Shack if we’re in Manhattan; or anywhere in Queens -- there are a lot of Filipino food places there, that we haven’t even gotten to explore yet but everyone tells us all about it! Park’s Finest BBQ in Historic Filipino Town, LASA is in DTLA Chinatown, Irenia is in Sta. Ana, Rice&Shine Pop-Ups by Chef AC Boral, Cafe 86 in Pasadena, Rice Bar in DTLA, and Chef Isa Fabro. All of these establishments are highly regarded in the food scene in LA/Southern California. Bad Saint is regarded as the #2 restaurant in the country, and with all due respect, yes! From the menu that pulls makes no compromises on flavor or breadth of offerings for such a small restaurant, it’s amazing to see this tiny gem of a place capture the attention of our capital and the country. If you have the time to wait in line, it’s definitely worth it. We also like Purple Patch in DC for their food and the community events that Patrice Cleary hosts in their space. Our stomping grounds! Isla Pilipina and Uncle Mike’s are neighborhood staples, and restaurants we frequent and have worked with before with our popups. Jenivee’s Bakery is relatively new to the scene but has lovely American Occupation era chiffon cakes with flavors like Ube Macapuno and Mango. Popups and farmer’s market staples like Pecking Order Catering; Hapa Chicago (popup); Taste of the Philippines; and our very own Filipino Kitchen, of course! Chef Cristina Quackenbush heads up a popup (formerly a brick and mortar, hopefully to resurrect soon!) called Milkfish. Another popup called Gata has also recently come to the scene, which we hope to check out! Chef Roland Calupe heads up a pop-up dining series called The Milagros Project. Ellie Tiglao is opening soon in Somerset, Tanam. Follow Filipino Kitchen on Facebook, Twitter, and Instagram. Water Ways is a collaboratively-drawn series of highly detailed pen and ink illustrations telling the story of impacts that the natural gas industry has on what is commonly known as Pennsylvania, New Jersey, and the surrounding area*. 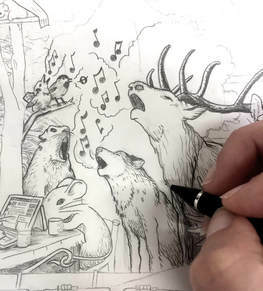 The illustration consists of dozens of interconnected vignettes that highlight people’s struggle with gas companies and government to protect the water and land we all need to survive. Water Ways is drawn by Bri Barton and Meg Lemieur. The final illustration has been printed into a 13’ wide fabric banner for presentations and is available online as 27” x 39” paper posters, which are accompanied by a 12-page narrative booklet that tells the story of the illustration. Meg and Bri teamed up at the end of 2016 to begin planning this huge undertaking, but they didn’t know each other very well at the time. Their friends had been telling each one of them for years that they should meet, but they only first met when a large protest banner needed to be painted to support Standing Rock. Realizing their similar love of collaboration, illustration, and environmental advocacy, they decided to jump into creating Water Ways, which ended up being one of the largest illustrations either of them had attempted before. In the months to come, Meg and Bri interviewed many environmental advocates across what is commonly called Pennsylvania in order to gain first-hand knowledge of how fracking has affected the land, the water, and the people who live near the fracking infrastructure. Their findings were saddening. They learned from articles and individuals that people were getting sick and even dying from the poisons leaking from these sites. The government consistently dismissed and ignored theses claims, a move that is by all means illegal. The publicity that the gas companies get tends to be positive or neutral, while those who are negatively impacted by the companies’ actions get brushed off or their claims are diminished. The urgency to tell the true story of those on the frontlines is more urgent than ever. Meg and Bri have developed an hour-long presentation that uses their 13’ wide banner to explore what fracking is, how the politics have been built to support the industry, who is resisting and how, what systems in our culture support extractive and damaging industries like fracking, and an overview of what we are fighting for and why. Since they completed the Water Ways illustration in September of 2017, Meg and Bri have presented at Temple University, the Philadelphia Museum of Art, Kimberton CSA, and a handful of craft fairs. They are taking Water Ways on tour in the spring and summer of 2018 to share the rights, struggles, and victories of the region’s water and all who depend upon it. They will also be gathering stories for future illustrations. If you live in the Mid-Atlantic region and would like to request a presentation, please contact them at thewaterwaysproject@gmail.com. *State borders are a relatively new construct, when you look at the grand scheme of the land’s history. State names were given by the colonizers, not by the people who have lived and have been living here from much before. There are many names for the land. So although we commonly refer to it as Pennsylvania, New Jersey, and other colonialistic state names, we feel it is important to acknowledge that these areas have held and still do hold more identities. One small way we can attempt to highlight the wrongs of the history is by decolonizing certain terms in our speech. Follow Water Ways on Facebook and Instagram. Sara Keel spent over a decade as a designer for the brand Anthropologie. She now owns her own company, Penrose Design Studio. Sara is an entrepreneur, mother, and advocate for slow-fashion. I have always been interested in fashion. I think it stems from my mom teaching me to sew and growing up sewing my own clothes, but I didn't consider a career in fashion at all because I wasn't exposed to it much as a child. My parents are in the medical and science fields so when I was younger I assumed I would do something similar in college. A year into college, I realized business marketing wasn't for me and I just wanted a career making clothes! I ended up transferring to Savannah College of Art and Design for Fashion. Soon after graduating, I signed on as an intern at Anthropologie, and ended up designing with the company for eleven years. The concept for my own design studio formed after I went part time so I could stay home and raise my baby daughter. I started designing and making clothes for myself while my daughter napped, and launched Penrose Design Studio (named after my daughter Penelope Rose) as a way to share what I was making with others. After a year of working part time I was accepted into a designer residency program in January 2017 which led me to commit full time to being an entrepreneur and running my own fashion business. Every day is so different. My business is very new and it is just me running the show. So, I am doing a little bit of everything during the week. I am currently hand-making all of my garments, so a lot of time is spent sewing and sourcing materials. On Mondays I work with an incredible intern who is a textile designer and helps me with hand-dyeing fabrics. She also doubles as my model so we use Mondays to photograph new products to add to the website and Instagram. I also use Mondays to review the budget, and plan social media marketing for the week. Tuesdays and Thursdays I keep my daughter home with me. She is two-and-a half so you can probably imagine I don't get much work done when she is there! I use those days to run errands, deliver new product to local stockists, and take her with me when I need to go out on inspiration trips. I am currently in a year long designer residency program called the Philadelphia Fashion Incubator, which helps designers start and grow their businesses in Philadelphia by providing workshops, resources, and mentoring. On Wednesdays, I have weekly meetings with the other five designers in the program and often following the meetings we have our workshops. Since I am still a new brand, I try to get as much exposure as possible. Many Fridays and Saturdays are spent preparing for and attending pop-up shops and events with local businesses so I can meet new customers face to face. How would you define the style of Penrose Design Studio? Penrose is free spirited and feminine, and I love vintage so you can usually find a touch of vintage influence in my designs. The silhouettes are relaxed and flowy and often are of one size so they can fit a variety of body types. Plus, they are super comfortable to wear. I use vintage materials like silk scarves so each piece has a unique print and pattern, creating one-of-a-kind pieces. I also hand dye so the outcome is completely different on each garment. My hope is that my customers feel as good buying a Penrose garment as they do wearing it. What are your thoughts on the slow/ethical/sustainable fashion movement? It is an absolute necessity for the future of our planet. The fashion industry is one of the worst on our environment, second only to the oil industry. The amount of pollution and waste created by manufacturing clothing is huge, not to mention the tons and tons of clothing that we throw out every day because something may be a little worn or out of style. It’s really terrible and has to change, and it is everyone's responsibility because we all wear clothes, right? I think consumers are becoming more and more aware of these effects and are starting to demand higher standards when it comes to the clothes they buy and wear. I believe larger companies that don't offer ethical/sustainable clothing options are going to have to make changes to meet the demands of the consumer. We have talked about this to some extent in our group at the Fashion Incubator. 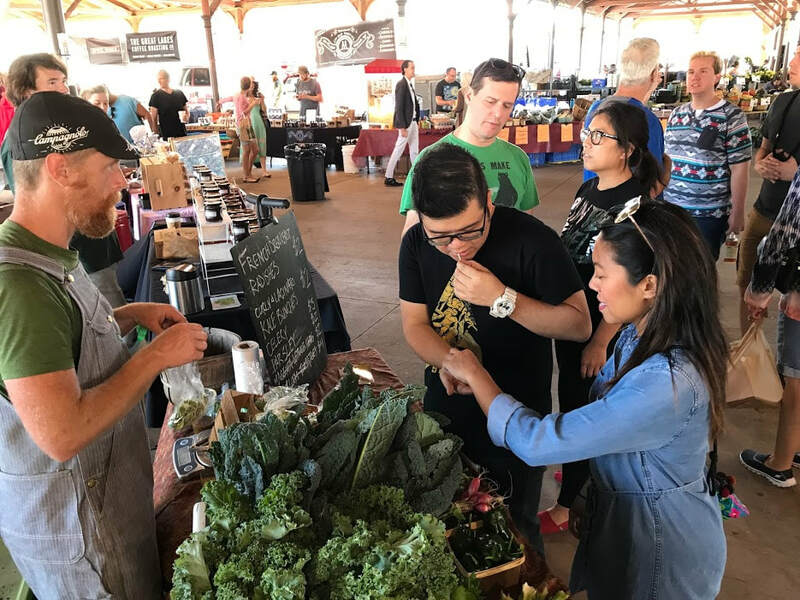 It’s like the organic food movement: you used to have to go to a farmers’ market or specialty store to buy organic food, but now almost every grocery store has an organic aisle, and it is because the consumer made the demand of the stores. But it is also the responsibility of clothing companies to help educate the consumer on how to make the change and join the movement. You’ve mentioned that you watched the documentary The True Cost. Did it in anyway influence your work or change your own shopping habits? It completely changed the way I consume fashion. I was pretty naive about the negative impact the fashion industry has on the environment and the often terrible working conditions of many factory workers in the industry. After watching the documentary, I decided to shop way less than I had been, and to only purchase ethical and sustainable clothing in the future. It actually felt very freeing in a way. I didn’t feel the pressure to buy the newest Zara pieces that drop on an almost weekly basis in order to stay “on trend” with my wardrobe. I had been working in the fast fashion industry as a designer for eleven years and had been sort of blinded by my work for so long. I felt like I gained a new sense of individuality with my wardrobe because I wasn’t guided by trendy fast fashion anymore. I went back to shopping a lot of vintage and remembered it is such a passion of mine! I have had to do a little research to find ethical and sustainable brands but it has been encouraging and fun learning about the slow fashion movement. I watched the documentary around the same time I was forming my clothing line so I vowed to create a brand that keeps sustainable and ethical practices at its core. And I am proud to say that Penrose is part of the slow fashion movement. Even if you are not into fashion I encourage you to watch this documentary, it is truly an eye-opener. We all wear clothes, so we are all responsible to educate ourselves (and our friends!) on the impact of what we wear. Do you have any advice for readers who want to move towards purchasing a more ethical wardrobe? I think there is a general misconception that an ethical or sustainable wardrobe means expensive, frumpy, organic, cotton frocks, but that is so not the case. There are many ways you can start to make little changes to your wardrobe without sacrificing your style (or shopping habit), and it doesn't have to be all or nothing. It is important to know there are different terms to be aware of: ethical, sustainable, organic, fair trade, and all can help you move toward a more ethical wardrobe. Buying vintage clothing is a great sustainable practice and probably the best way to cut down on clothing waste. 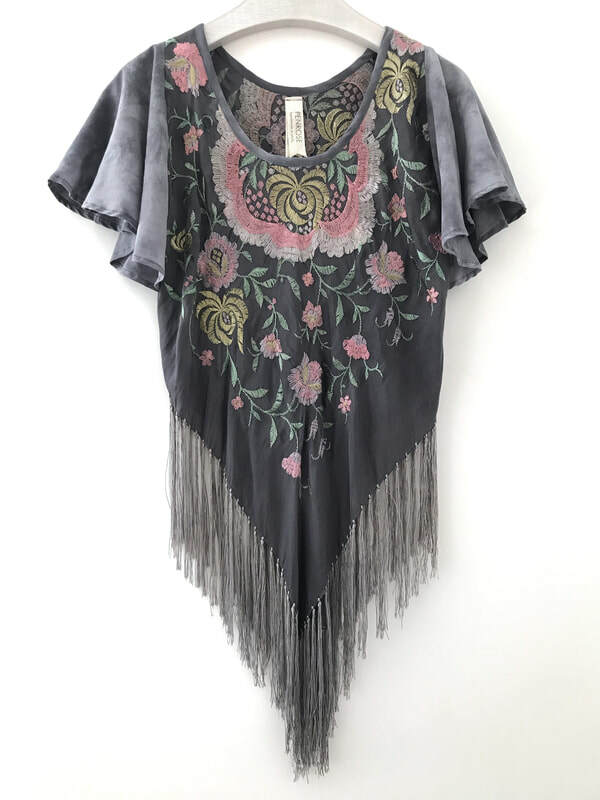 If you aren’t into wearing clothes from a different era, online retailers like The Real Real (a luxury consignment retailer) or Rent the Runway (designer clothing available for rent that allows you to wear something “new” every day) are other great alternatives to buying new clothing. When you are shopping, look for brands that give clear information on where their goods are made. Ethical brand will often show photos of their factories and will even name the individuals who sew their clothes. This is a good sign the brand follows ethical manufacturing practices. There are some great websites like Ecocult which is an ethical fashion blog and lists ethical and sustainable brands on their site. Another great place to start is right in your neighborhood! Try shopping in local boutiques. These are small independently run business and a lot of the time stock locally designed and made clothing and accessories. Lastly, try to make the clothes you already have last longer so you need to purchase less. I think proper laundering is a largely overlooked aspect of an ethical wardrobe. Washing machines and dryers can be hard on clothes and really wear them out if they are not washed properly. Make sure you understand the care labels of your clothes so you don’t ruin them in the wash, and you can avoid throwing out that sweater you shrunk and buying a new one (this has happened to me so many times). Many companies will list garments as “Dry-clean Only” (a process that uses chemicals which harm the environment) but often the clothes can be washed in cold water and line dried. You can also put clothing in the freezer to refresh your clothes and kill odor causing bacteria, which also cuts down on the water you would otherwise use to wash in your machine. It feels great to say that because I am still a very small brand. It is easy for me to incorporate sustainable practices into my business model. I am able to use vintage and materials like silk scarves in my designs so I don’t have to buy and produce new materials. Several of my pieces are made to order so I am not over-producing and creating waste if something doesn’t sell, and sometimes I even cut and re-sew or overdye pieces from a previous collection to create new designs. I also use leftover scraps from previous designs in new pieces. I realize it is a brand’s responsibility to educate the consumer about the importance of sustainable fashion so I am using social media and marketing to give this message to my customers. It has been an unbelievable blessing and gift to have the opportunity to start my own business. Since being in the Fashion Incubator, I have experienced an incredible amount of personal growth, learning about business and entrepreneurship with a talented group of designers and amazing mentors. The creative freedom of running my own business has given me new life and much fulfillment I didn’t realize I was missing. Above all else, the most important thing at this stage of my life is time with my daughter. Working for myself has given me a flexible schedule that allows me to have my daughter at home with me two days during the work week (she is in daycare the other three days). We have had the best time learning and growing together and I would not trade those moments for anything in the world. What are your hopes for Penrose in the future? As my brand grows, I want to be able to partner with artisan groups globally to produce my designs and develop programs to help give back to their communities. With the rise of fast fashion it is harder and harder to find beautiful handcrafted goods, so I hope to do my little part to help preserve those practices and give artisans the wage they deserve for their craft. And I am dreaming of developing a system for recycling materials (like scraps from past seasons’ designs or vintage materials) into new garments on a larger scale to help reduce waste. Any weavers out there interested in using fabric scraps to weave new materials, give me a call! Reformation - Great dresses and other fashion basics; this brand is committed to sustainable practices and it gives information on the environmental impact of each of their garment. Maiyet - A luxury fashion brand that partners with artisan groups around the world, which promotes self-sufficiency and entrepreneurship within those communities. Study New York - A sustainable fashion brand that is manufactured in New York and is transparent about where their raw materials come from. They even use the scraps from previous designs and weave them into fabric for new designs. Rent the Runway - A huge selection of designer clothing available to rent. They have several subscription options so you can wear something “new” every day. The Real Real - A luxury consignment retailer. 1st Dibs - An amazing designer vintage and home pieces. Accompany - An ethical fashion online retailer that stocks artisan made goods. Ecocult - An eco fashion blog with tons of great information and a comprehensive list of eco and sustainable fashion and lifestyle brands. Fashion Transparency Index - Created from research done by the Fashion Revolution, it highlights the business practices of the top 100 fashion brands. Definitely worth looking into brands you shop - some of the results are shocking. Philadelphia Fashion Incubator - I am currently a Designer-In-Residence in this Philadelphia based program aimed at fostering small business in the Philadelphia area. Samantha Owens is the Programming and External Relations Manager for The Post-Conflict Research Center (P-CRC) in Sarajevo, Bosnia. P-CRC works to restore a culture of peace and prevent violent conflict in the Western Balkans. They do this by creating, implementing and supporting unconventional and innovative approaches to peace education, post-conflict research, human rights and transitional justice. March 20, 2017, Zenica - A stray dog is seen in front of a graffiti saying "Volim te (I love you)." The total number of stray dogs in Bosnia is unknown, but in Zenica there is estimated to be more than 6,000 and in Sarajevo more than 15,000. Tell us about how you got connected with P-CRC? From 2014 through 2016, I was working for Chicago-based ART WORKS Projects and we had gotten a MacArthur grant to do a four-part exhibition about transitional justice in different environments; the US, Colombia, Democratic Republic of Congo and BiH (Bosnia and Herzegovina). As part of this curatorial process, we hosted representatives from each partner organization for a workshop in Chicago, where I met co-founder of P-CRC, Leslie Woodward in 2016. July 13, 2017, Zenica - Sunset above Arcelor Mittal steel factory in Zenica, that once used to employ about 40,000 people. Currently less than 5,000 people work there. According to World Health Organization (WHO) data from 2017, Bosnia and Herzegovina are the most polluted country in Europe. Leslie and I hit it off and hung out after the workshop talking about what we were interested in, what we were working on, what we wanted to work on, and we really clicked professionally. ART WORKS was in a period of transition and I was figuring out what my next steps were going to be. I had always wanted to live in the Balkans as my mother is a first-generation American born to Croatian parents and my mother’s side of the family is all either Croatian immigrants or first generation. Leslie had someone leave the team recently, so it was sort of just kismet. That was in April 2016, I believe, and I finally made it to Sarajevo in December 2016. March 27, 2017, Zenica - Alen Marijanovic is seen reading a brochure "Welcome to Gelsenkirchen." It's said, that roughly 100,000 people have left Bosnia, in search of a better life. What projects is P-CRC currently working on? We are currently working on a photo-based exhibition about the Roma population in BiH, which I am really, really excited about. They are a very marginalized group, they were profoundly impacted by the war, but their stories are rarely told. So, our goal with that is to challenge the stereotypes about the Roma by giving them a platform to share their own stories. We are also introducing a digital component to our Ordinary Heroes project, using stories of interethnic wartime rescue to combat divisive, nationalist narratives online. 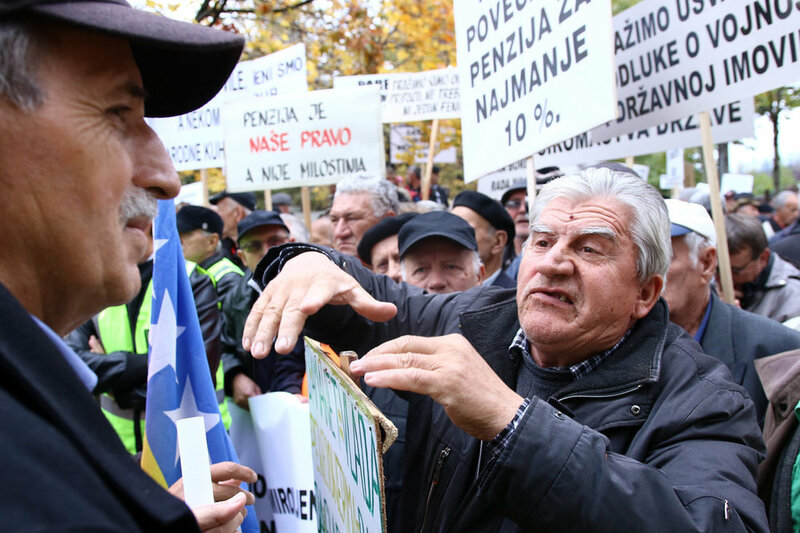 October 25, 2017, Sarajevo - Pensioners protest. In addition to our new projects, we have several ongoing programs including; the Peacebuilding Program, Balkan Diskurs, and mentoring Balkan Diskurs’ youth correspondents. We also work with the ICTY’s Outreach office, who work with the United Nations to monitor conditions that could lead to genocide and mass atrocities in the region, and are also the organizers of the WARM Festival run by WARM Foundation. We have so many projects constantly running, I am in awe of my colleagues and our intern teams who do so much with very limited capacity. Again, I would encourage anyone interested in learning about our work to visit our website. We recently re-designed it. You can see a good selection of our visual content, too. October 17, 2017, Sarajevo - Protests against the water restrictions in Sarajev. Most households don't have water from 12am to 6am, and many go without any water entirely. have studied the region in undergrad, grad school, and been living here for a year and this is still a question I am trying to wrap my brain around. Let me preface this by saying that everything I am about to say/observe is my own views and not any sort of official stance by P-CRC. I just want to be clear about that since so many aspects of the conflict remain contentious. For a very, very brief history lesson, for those who weren’t around or don’t know about the Yugoslav Wars of the 1990s, I will just give a bit of background. Yugoslavia was a multi-ethnic state held together by Josip Broz Tito from the end of WWII until his death in 1980. July 10, 2017, Srebrenica - A woman mourns next to the coffin of her sibling. After his death, national identities became stronger and in some cases, nationalism among the various ethnic groups and regions bubbled to the surface. Various regions began declaring independence--first, Slovenia, which is ethnically and linguistically perhaps the most “different.” Bosnia declared independence too; however, as it was/is the most ethnically mixed state, its independence was the, what’s the word, perhaps the most “controversial”? Serbia declared it part of greater Serbia, while Croatia also laid claim to parts of Western Bosnia. What this resulted in was the horrors of ethnic cleansing and genocide that most people associate the war with. Twenty years on, I would argue, it remains a frozen conflict in a lot of ways, as the Dayton Accords, which achieved immediate peace through segregation and institutional separation of the various ethnic groups, became the constitution. The peace is therefore very fragile, and, in its current form, not sustainable, as you cannot just keep people separated forever. That is not a durable solution. What we are seeing now, among the generation that is currently coming of age, is this internalized division that has been fostered not just through family and community narratives about the war, but also through this institutional segregation. There are certainly young people who are working to make BiH more unified, but it’s an uphill battle when the entire political system is designed to keep you separated. April 2, 2017, Sarajevo - Medical High school students worked jobs to raise money for their friends who could not afford a trip at the end of the High school. Pictured here, the city of Sarajevo hired them to clean Miljacka riverbed. In what ways does P-CRC engage with communities in peace-building? Because there is so much bureaucracy in BiH--for instance, there are three presidents at a time, one from each ethnic group, who rotates "charge" every eight months--operating outside of formal structures is the most effective way to work. That’s one of the beauties of working through multimedia and the arts; you can set up an exhibition and it reaches people in a natural, organic way. We make sure all our exhibitions are as accessible as possible; typically, they are outdoor installations, set up in a heavily trafficked public space. To reach young people, we have an extensive network of grassroots youth centers, youth programs, activists, and so on, across the country. We, again, work outside the formal school system so that we don’t get paralyzed by the red tape. We have found this to be an incredibly effective approach. We also do our best to offer young people opportunities that are mutually beneficial so it’s not just like “here, come to this training so we can tick the box that we did it.” We impart psycho-social skills, offer journalism and multimedia trainings, and, for some young people, offer compensation for articles they’ve written about their communities or specific issues in BiH for publication on Balkan Diskurs. March 15, 2017, Sarajevo - Kenan Hidic who has learned the craft from his father, is using shells from the war in Bosnia 1992-1995 to produce souvenirs that decorate homes around the world. How did P-CRC come to exist? I can’t put it any better than the "official" statement on our founding, which was put together by founders Velma Šarić and Leslie Woodward: “The story of the Post-Conflict Research Center (PCRC) began in Sarajevo in the summer of 2010. While living on opposite sides of the world, global technology supplied us with our [sic] some of our most powerful tools. Equipped with two Mac computers and Skype, we spent countless hours developing plans to create an organization dedicated to building peace a reality. December 11, 2016, Kozarci - Illegal miners are seen exiting a mine. Miners work with makeshift tools and dig out coal from illegal mines earning 20KM a day, and digging out about 40 tons of coal. What does your day-to-day look like in your role? For anyone who has worked for a grassroots NGO, you know that you basically wear every hat. For me, I work on our grant applications, overall messaging, social media, article editing, project management, project design, and I help with management of our intern team. So, every day is different, which is something that I enjoy. Also, we share our office building with a pensioners’ chess club so I spend some time each morning speaking to them in broken English/Bosnian combination, usually answering twenty questions about why I am not dating anyone, which is always pretty funny. September 21, 2016, Zavidovici - Indira Sinanovic was the first women wearing hijab to run for City council of Zavidovici during the 2016 elections. What is it like to live in Sarajevo? Life here is lived at a much slower pace and on the weekends my life basically revolves around going from café to café, reading, meeting friends, drinking far too many coffees. It’s a funny combination because life feels much easier and laid back, the city is small, you are constantly running into people you know, you have your regular spots. But, in other ways, some of the minor day-to-day things are incredibly difficult. For instance, paying bills, picking up packages from the post office, doing any sort of paperwork, each one is a full-day process running from office to office. So, it’s a strange dichotomy in that way. December 28, 2016, Svatovac - Nazif Mujic is a Roma "actor". He was starring in Danis Tanovic's movie about Roma life in Bosnia. He won a Silver Bear award in Berlin for that movie, which he sold for 4,000 Euros. Actually, I think the city is very much a city of contrasts. There is a lot of beauty, coupled with a lot of pain, "Eastern" culture mixed with "Western" culture, laid back but very much alive. One thing I’ve really noticed is that you do feel every day that you are somewhere special, there’s something really captivating about the city. It also has a really strong sense of community that makes you feel really safe. It was so funny, moving from Chicago everyone was so worried about my safety, but I feel exponentially safer here than I do in the US. November 22, 2016, Sarajevo - Ismail Zulfic is a boy born without his two hands. With no help from the country Ismail lives a normal life, he is going to school, he swims and skis. Can you recommend a book or article related to your work? Again, this question can get tricky as accounts of the war can be contentious; there are a lot of opinions about various scholars who have written works. I found The Balkans: A Short History by Mark Mazower to be really helpful in terms of an overview of regional history. Specifically about the war, the chapter in Samantha Power’s A Problem From Hell: America in the Age of Genocide about Bosnia is a good overview of international inaction while atrocities were being committed. I read a great article recently in The Economist about Bosnia’s collective sense of humor and its use in processing collective trauma. The film Grbavica is also great, and the photography of Ron Haviv is beautiful and heartbreaking. February 15, 2017, Prozor - Ramsko Lake is seen dried out due to the increase in the production of electricity. I think, unfortunately, for a lot of people, Bosnia has basically become synonymous with “genocide.” While the 1992-1995 was certainly a watershed period in the nation’s history, there is so, so much more to Bosnia than just the traumas of war. I think commemoration is incredibly important, but I also think recognizing the beautiful parts of Bosnia and the resiliency of Bosnians is just as important. Reducing an entire country and a thousand years of history to three years of conflict can be easy to do—especially when those three years are full of horror and trauma and international headlines—but is, I think, unfair to the richness of the country. There’s history, there’s culture, there’s strength, there’s beauty that should also be recognized and associated with Bosnia. June 20, 2017, Sarajevo - War Hostel is a unique experience in Sarajevo. It's a hostel where the sound of shelling is played during the night and there is no electricity. They use candles and sleep on the floor. When you knock on the door, a man wearing a uniform greets you. In 2016, official data say that 90% of tourists that visited Sarajevo, came only for war tourism. To follow P-CRC's work connect with them on Twitter, Instagram, and Facebook. Photography and captions by Armin Durgut.